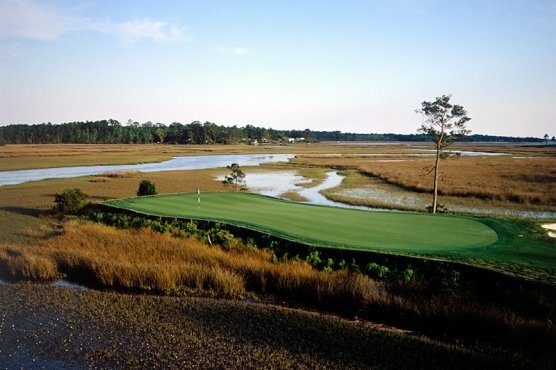 LONGS, SC – The 17th hole on the Old Course at St. Andrews is like no other hole in the world and gave fame to the term “Road Hole.” It’s my guess that numerous golfers bound for the Myrtle Beach Area and arriving on Highway 9 have used the term “road hole” when passing Aberdeen Country Club. Always in good shape, the course puts its best foot forward showing off Highlands Hole 6. Opened in 1989, Aberdeen is located along a protected riverfront preserve, teeming with wildlife. Although slightly off the beaten path, Aberdeen Country Club’s award-winning 27-hole layout, designed by Tom Jackson, delivers considerable Scottish flair. From the Championship Tees each of the courses – the Highlands (3,405 yards), Meadows (3,306 yards) and Woodlands (3,445 yards) – can be paired to present a challenging round of golf. Combined with the natural beauty of its natural surroundings, along with the course’s Tif-Eagle Bermuda greens, be ready for a memorable day. One of the major points I’ve always liked about Aberdeen is its straightforward design. There’s nothing “tricked-up” about the course. Everything you need to know is right in front of you. There are no forced carries if you’re playing from the proper tees. Although the landing areas on many holes, appear narrower than the fairway they are not necessarily overly challenging. No matter what your skill level, do not hesitate to use a fairway wood or long iron off the tee. Hitting fairways is a good thing! A case in point is Hole 6 on the Highlands course. From the Members Tees (White Tees) the hole will play 345-yards. A 210-yard drive in center fairway leaves a very doable approach shot to a green that’s well protected by sand hazards to the left and water to the front and right. An errant drive off the fairway, left or right, brings trouble into play. Play to the center of this generous green. On the Woodlands Course Hole, 1 is a great challenge. At 380-yards from the Members Tees, it looks just a little intimidating from the tee box. Wide right and you’re wet, wide left and you just might be in tree jail. Hitting a good drive is imperative. Choose your approach shot club wisely. The green is small. Hole 3 on Woodlands is a great Par 5 at 502-yards and the 3rd hole in a series of 4 outstanding starting holes. You’ll earn your Pars and Birdies here. The water that creeps to the very edge of the fairway is reachable by the average hitter at 227-yards from the White Tees. Going further to the left brings hardwoods and pines into play. Your second shot has water and sand in play, but only catching the most errant shots. Again, your final approach shot needs to be the correct distance as the green is only 31-yards deep. The Par 3s are all in the 145-165 yard range from the White Tees. Each is different and presents its own challenges. Hole 7 on the Highlands at 166-yards is particularly interesting. Traps and trees to the left will tempt you to not finish a swing and leave yourself far right and facing a difficult up and down. Choose the correct club to clear what looks like a false front, commit and finish your swing. A trap on the left is better than a long chip to get up and down for par. Although located in a residential area, you will feel in touch with nature when playing Aberdeen Country Club. Arrive in time to take full advantage of the driving range and putting green. At first glance, the course might seem to be a good idea for a round either to or from the beach. I suggest you might save that round for your final day of play. That Woodlands Course nine is a handful but will provide a bunch of memories.